Favorite class to teach: Outdoor grilling classes because that means that it's not winter anymore! Training/education: Culinary Arts - Escola Superior d'Hostaleria de Barcelona. Cooking since: Professionally since 2001. Favorite childhood food experience: Sunday lunches at Don Carlos and El Hispano (restaurants in Buenos Aires), eating escargot and frog legs with my family. What made you want to become a chef? My passion for cooking, and the possibility of traveling that this profession gives to chefs. What is your signature dish? I have more than one favorite dish. I'm partial to seafood in general, but specifically, I really enjoy cooking octopus, squid, and shellfish. What are the 5 ingredients you can't live without? Onion, garlic, cooking wine, soy sauce and olive oil. What do you love about cooking? I enjoy the whole process of cooking (from the planning to the physical act). When the results are positive and you can share them with people, it's very satisfying. When you're creating a new recipe, what influences and inspires you? Curiosity, I guess. I like to cook with ingredients I've never worked with before or techniques I've never tried. What advice would you give a new cook? Advice? Me? Ha ha ha! What are you doing when you're not cooking? Reading, watching films and writing. Describe your perfect evening. Friends, good food, good wine and good music. If you had friends in from out of town, where would you take them to eat? To a good old school diner if they are not American. I don't think you can get that experience anywhere else. Where are you from?I was born in Buenos Aires, Argentina. What was your favorite vacation? Borneo. What are your hobbies? Books, films, traveling and diving when I can. What is your favorite band? Ramones though the Pixies are very close. What is your favorite sports team? C.A. River Plate / Barcelona F.C. If you could have dinner with one person, who would it be? Orson Welles. He loved eating, drinking and good stories. What are your guilty pleasures? Cavity-producing candy. What resources would you suggest for Chopping Block clients? On Food and Cooking by Harold McGee. Have a plan before you start cooking. It saves a lot of time. A good mise en place list is your best friend. Always have a garbage bucket/bowl close to you at your work station. You don't want to be walking all the time to the trash can or have a messy working surface. Taste everything before plating. The work of many hours can be ruined by under-seasoning or over-seasoning. 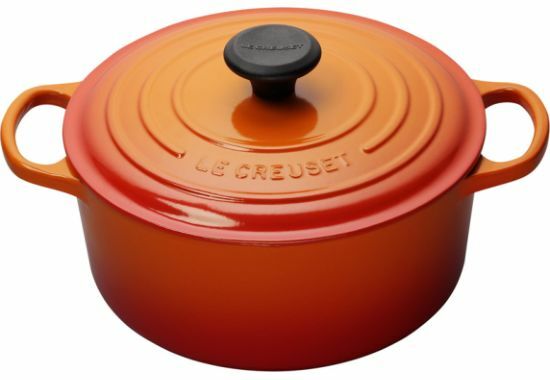 My favorite piece of cookware at The Chopping Block is the Le Creuset Dutch Oven. You can cook almost anything in it, from stews (either on top of the stove or in the oven) to bread. It keeps an even temperature, and it works great when browning vegetables or searing meats. It's easy to wash (the enameled surface makes a big difference here) and long lasting. What else can I ask for from a piece of cookware?